Have you been in search of an oil that will combat frizz and add in that much needed moisture to your dull, dry locks? And of course, it can’t leave your hair feeling coated and weighed down…no way! 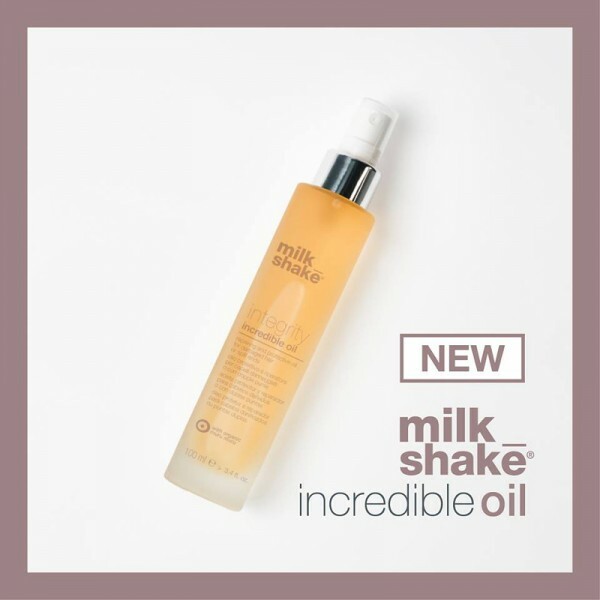 Well look no further than Milk_Shake’s NEW Incredible Oil. It’s an intensive, leave-in, light-weight treatment formulated to help prevent split ends and protect your hair from the angry heat of blow-dryers, irons, and other stress factors that weaken the hair. It’s super light-weight formula nourishes your hair with no greasy after feel. It’s even light enough for super fine hair! Oh, and it smells absolutely delicious…what else would you expect from Milk_Shake right? How to use: Apply to clean, towel dried hair before you blow dry. You can also spray on dry hair for a high gloss effect. You can find Incredible Oil on our shelves right now. Just $38 bucks and you can add this secret weapon to your hair arsenal today!